Everyone loves ice cream (well, except those that are cursed with lactose intolerance of course). Whether you're young or old, big or small, short or tall, ice cream is an age-old dessert favourite. It's quick, easy, and these days there are so many varieties of flavours that there really is something out there for everyone (except maybe for those cursed few I mentioned earlier, sorry). Now, as well as the standard supermarket tub varieties of ice cream, there are also ice cream and dessert parlours across Australia full of cold tasty treats waiting to be devoured. Baskin-Robbins, Strathpine, is located in an alcove of stores on the busy Gympie Road near Westfield Shopping Centre. Set amongst The Coffee Club, Nando's and Video Ezy, Baskin-Robbins stands out with its trademark bright pink and blue sign and colourful décor. 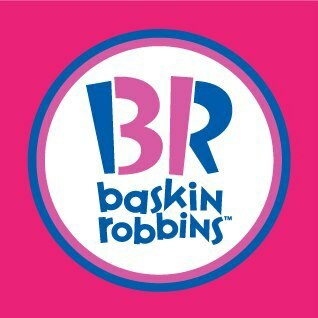 With eye-catching signage, advertising, and the trademark pink and blue, Baskin-Robbins gives off a welcoming atmosphere before you even walk in the doors. At Baskin-Robbins you can order different sized buckets of ice cream to take home, or you can choose an eat-in dessert from the menu. There are also ice cream cakes that can be pre-ordered for birthdays or other special occasions and a variety of beverages such as shakes, blasts and ice cream or yoghurt based smoothies. I'm currently in love with the vertical sundae; a dessert served with two scoops of ice cream, warm chocolate brownies, fresh cream, chopped almonds, topping (chocolate or caramel) and a cherry. Vertical sundaes can also come with cookies, chocolate, Smarties or cookie dough. Last time I went to Baskin-Robbins, I got myself a vertical sundae with jamoca and coconut ice cream (mmm, coffee creamy heaven). It cost me $8.90 and looked/tasted amazing. I always pick caramel topping and I definitely have the warmed-up brownies with cream, sliced almonds and a cherry. My brother chose two scoops of ice cream for $6.75, the cotton candy and wild n' reckless. Baskin-Robbins is a great place for the whole family. Whether you want some after-dinner dessert or just a treat, Baskin-Robbins is the place for you. The Baskin-Robbins website has details of competitions, nutritional information, history, flavours, a cake gallery, contact details, franchise opportunities, a restaurant locator and information on the Baskin-Robbins loyalty card. Visit the Baskin-Robbins website here. Visit the Baskin-Robbins Facebook page here. Why? Because you like ice cream. When: Whenever you're craving ice cream. Where: Baskin-Robbins, 328 Gympie Road, Strathpine, QLD. I've been tempted by Baskin Robin so many times, but I always resist because it is just so calorific. If it were somewhere I could go for a proper lunch, and then try a small portion as a dessert, I'd be in there in a second.